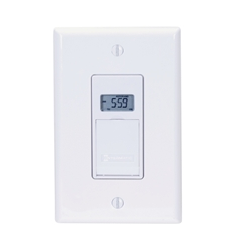 The Intermatic EJ600 is Intermatic's newest in-wall timer and replaces a standard wall switch to provide timed on/off events based on a schedule or sunrise/sunset times. It's programmed with the new DST times for USA and Canada and has a built-in astronomical clock so that sunrise and sunset change with the seasons automatically so you can set it and forget it. 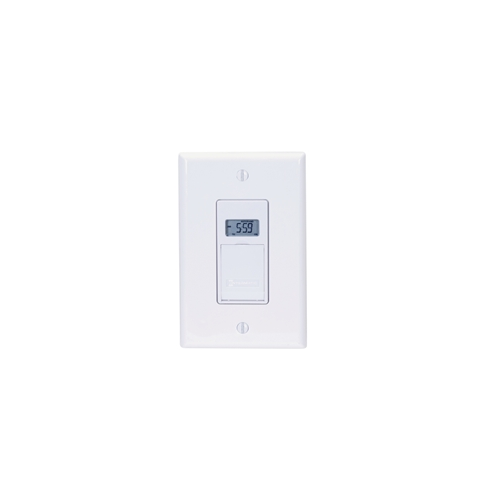 The EJ600 supports most loads including regular incandescent lights, fluorescent and compact fluorescent (CFL) bulbs and ballasts, fans, appliances, motors, etc within its specified ratings (see below). The EJ600 can be used in single pole (one switch) and 3 way (2 switch) applications, has an LCD readout for time and ease of programming. It also supports manual override and has a battery back-up so programming isn't lost during power failures. The Random feature option is great for security and ensures the house has a more natural lived in look rather than a strict timer controlled look.